As the CEO of the Rosewood Hotel Group, Sonia Cheng is very much responsible for the hotel brand’s big-thinking long-term vision—as well as for the brand’s rapid growth over the past few years. 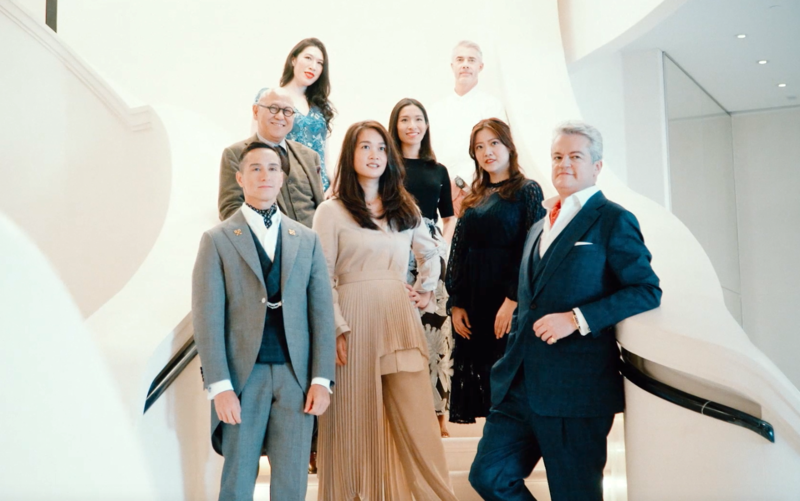 But when it came to our cover shoot celebrating the opening of the Rosewood Hong Kong, an ultra-luxury hotel on the Tsim Sha Tsui waterfront, she wanted to share the spotlight with leading members of the creative team that brought her vision to life. “This hotel is a collaborative effort,” she said on set. So this month’s cover features not one but eight stars: Sonia; Marc Brugger, managing director of the hotel; Waldo Hernandez, chief concierge; Karina Wan, director of event planning; Sandro Gamba, director of culinary operations; Lois Tien of Anagram; interiors maestro Tony Chi; and artist Chloe Ho. And that’s just in that one photo. Later in the day we photographed this octet and other key figures involved in the property at several Rosewood Hong Kong locations, including the wraparound terrace on the 40th floor, which has striking views over the harbour and skyline, and the Manor Club executive lounge. Some of the stars of the shoot are actively involved in the day-to-day running of the hotel, while others are creatives who collaborated on specific aspects of the project. Sonia Cheng CEO of Rosewood Hotel Group; spearheads global expansion of the company.